It is now Easter-Holiday here, and we hope to enjoy some lovely springdays in the countryside. Everything looked promising regarding the weather: the last couple of weeks in March saw some amazingly warm days. Summer-temperatures ar this time of year is quite unexpected. But after a relatively long winter this treat was quite welcome by most people. Sunbathing in bikinis is normally not a spring-thing here. But more than 20 degrees celcius, makes March 2012 a record-breaker. Lovely with summery temperatures, of course. Flowers popped up in the gardens. I can't remember ever the mini-daffodils flowering in our garden in time for easter. The white anemones that normally appear during April, have been about for some time already. But as April started, frost returned. Crisp and cold nights and windy days. Sun and dry weather. Living in the middle of a forest makes you wish for some rain soon, now that all the snow has long gone. Very dry on the ground. Already there have been some minor forest-fires in the area. It's time for a rain-dance! The Early Frog....Catches a Cold? Yesterday we met a most unexpected spring-messenger: A real frog was out in the lingering snow. Winter's "left-overs" still lay everywhere out here, you see. Still no sign of daffodils, snowdrops or anemones. But this frog apparently set its biological clock extra early in order to get the most out of the season. Poor little thing. It must have been a bit of a shock to find itself surrounded by winter. A very cold experience. No warming fur, no insulating feathers. Just thin and slightly wet skin. Brr! I took some photos and left the frog where I found it. It was all I could do. Don't think it would have liked to spend some weeks in my care, somehow. Hope it survives the last traces of winter. Frogs do a brilliant job catching insects. I don't mind them being around at all! The more the merrier, I say! This frog shows us that winter is finally defeated! Birds know it. Cats know it. The calendar shows it. Now all we need is for the weather and temperatures to come to the same conclusion. If you glance at the calendar you would expect to find snowdrops and daffodils surfacing all around the garden. After all March is the month of SPRING. It so happens that after a winter that has lasted from November I do feel like a change. The garden is still covered by a thick layer of gritty snow however. But just a few miles away most of the white stuff has melted away. We must live in a place that has a delayed change of seasons. But the birds are not fooled! Just the other day we woke up to the soft voice of a blackbird. Really beautiful! It was perched on the top of a tall spruce-tree paying homage to the sunrise. A new day, a new season, a new life! And my eyes show me more proof of spring: they itch from the pollen from hazel-catkins and those of the alder. Both speices are plentiful in the area. January did not bring about any big changes in our lives, but that's just as well. I don't really want alterations at the moment, unless they involve winning lots of money! Why does money seem to be so essential? I used to get a bit annoyed when I heard people say "money really isn't everything" or "You cannot buy happiness"
Of course there is some truth in this. But sometimes, I thought, people who insist on this are probably rich and don't need to worry about the next batch of bills. As predictable as Christmas-traditions is the fact that New year brings us back into the Season of Bills! The first three months in particular make me wish I had 13 million in the bank. Imagine how much easier life would be then...! Or would it? Certainly I could open the postbox without dreading another fat bill. All bills could be paid as they arrived. Just like that! I could go to the interior-shops and get whatever I wished for. I'd buy a new car, too, with all the latest gadgets, (-I could even pay somebody to come and show me how to use them if I didn't bother to read the instructions myself..) Only the best food would reach our table. (The healthiest stuff often seems to be the most expensive) I could get professionals to make us a new bathroom with a lovely free standing bath-tub, and tiles... Just being able to make every materialistic dream come true sounds like a safe route to happiness. Or a carefree existence. But would money me a happier person in the long run? I'd like to think NO. And a big part of me knows that being rich will not on its own bring about happiness. It depends how you define the term "rich", too. I have a plan: when I win my 13 mill, I will be sure to help others. Family, friends, organisations I support etc. I believe that happiness is not the destination but a way of travelling. Money is not the only way to make a difference. Every little step I actually take, is more important than all the steps I should have taken. I will venture into this new year by focusing on what I already have. And count my blessings, as they say. What a beautiful weather we've had for a while now! Snow transformed Kristiansand and turned everywhere into a Christmas-card-scene. It's like we have spent December in a new location known as Winterwonderland... After many late workingdays in November and December I haven't been able to see our home by day. The winterlight has been absolutely fantastic! Mindy is not too happy about cold weather, and there has been down to minus 18 centigrades some days. Freezing cold! This is the time of year where there are plenty of traditions to follow. Many things should be ready for the big day. This can cause stress and frustration if, for some reason, you can't manage to to it in time. I understand more than ever before why Mum has been feeling a bit low about this special time of year. High expectations of meeting everyone's wishes, putting up decorations, cleaning, making all sorts of food, buying gifts, etc. Thanks to all her efforts I have grown up to love Christmas-time. MY Christmastime! I enjoy the warmth and light it spreads. I love the memories of every Christmas past. Lots of emotions surfaces at this darkest and coldest time of the old year. December is lined with frosty lace in nature, spiced with smells of christmas-cake (-the English way) cinnamon, ginger, incence, freshly picked sprigs of spruce... All those old bits and pieces come out from the cupboard... The shiny adventstar back up in the window. Childhood-memories queue up outside a preoccupied mind. Haven't got the time to take it all in now. Busy busy busy... List gets longer and longer with more important stuff that needs doing. And time never speeds along faster than now in December. I really wouldn't mind an extra week or two thrown in... But time flies. And time changes... My priorities have also altered somewhat. As a kid the presents played an important part. Now the essense of Christmas is to be with my nearest and dearest. Christmas arrives whether or not I have washed everywhere, baked the correct number of cakes or sent all cards. I think I am about to learn something important about the spirit of Chrismas. There's always room for new traditions and new improved ways of siezing the moment. After all the most important thing is that you keep Christmas the way that brings you a genuine feel of this special season. Whatever you do, be sure to have a very Merry Christmas! Most people I know don't like the season which is soon taking over. 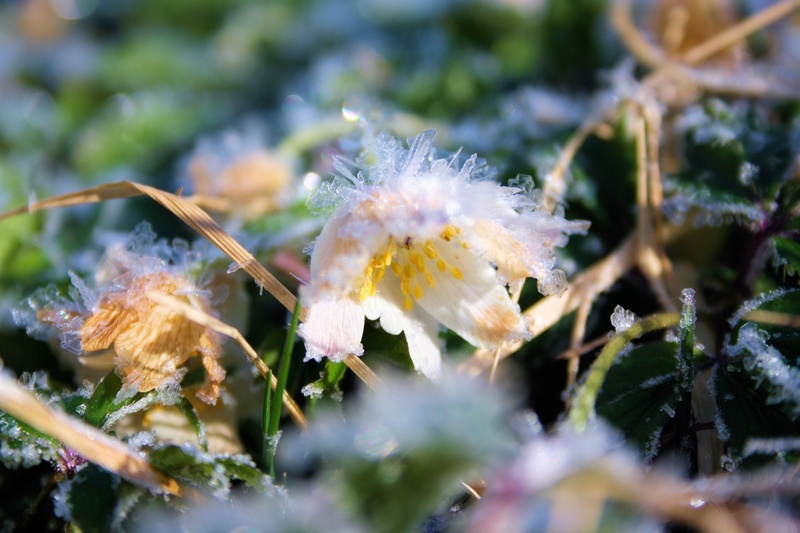 As Autumn turns gradually into winter around us, we get frosty mornings. It creates real beautiful vistas in our area. I have been photographing as often as I can, and feel very lucky when all the right effects come together at the same time! Mushroom-season is almost over now. We had our first encounter with snow on Wednesday 20th October. This always is an interesting day for car drivers: will we stay on the road or not... The roads were glaced with ice and extremely slippery last Thursday, 21st October. Pure luck (and perhaps the fact that I am driving slowly at the best of times ) prevented us from an accident. Quite scary! But every cloud has a silver lining: at least this experience sorted out our priorities! The moment we stopped in the driveway at home we agreed: new studded tyres are at the very top of our wish-list! Safety first! We are already well into the first real month of autumn! so far there has been some beautiful days, so naturally we must go mushroompicking in the forest. With rain falling at the critical moment there has been perfect conditions for my favourite, the penny bun, or cepe. (Boletus edulis, to be precise) I particularly like finding and picking mushroom. It falls on Steve to eat them. He doesn't complain; he loves mushrooms. In fact he ranged taste of mushrooms at 9 on a scale from 1-10 the other day! Cepes have a lovely nutty smell, and they look just so perfect! Nature has turned into a slower and more quiet pace now. A couple of mornings there has actually been frost in the grass. But still the latest of the summerflowers linger. And our garden toads. "aren't you supposed to go hibernating?" I ask them. "We don't want frozen toads all over the front porch!" Autumn, with its colours. Foggy mornings, fresh cool air. Dramatic cloudscapes and the intensely blue sky. Nature is preparing for the next chapter. But first we will go through the rest of this one. Toadstools and all! Hope you will enjoy the autumnal glory too! I am starting to see hints of autumn around us. Too soon... The evenings are getting darker, morningtemperatures under 9 degrees celcius e.g and there's fog on the lake. Bats are hunting in the light of our doorlamp, wasps invade and eat ripe plums on our trees, or fly around in a daze. Blueberries, blackberries and other fruits appear for those who are fast enough. I have managed to make blackcurrent-jam at least. Hazelnuts ripens in the forest. And yellow leaves are falling. Summer is ending for sure. However, today was bright and warm again! We have been blessed with sunshine and high blue sky! (Even the garden-weed, which unfortunately have enjoyed a particularly good year this year, looked innocently summery.) I have picked the first chanterelles. Today we found a plump penny bun ( boletus edulis ) Autumn has definately its advantages! Particularly for us mushroom-hunters. It could be a great year again providing the frost doesn't arrive too quickly and spoils the fun. The end of summer also means back to work and business as usual. However this makes weekends stand out like sanctuaries again. I enjoy my work, but weekends are particularly welcome! And in all this our good old Lexy stay indoors. She has always been suspicious of other cats. She runs back in if she sees any of the Balts. We try to encourage her, but her mind is made up! She enjoys the warm and quiet and "almost cat-free" indoors, curled up in my best office chair, purring contented to herself. Not exactly born to be wild, are you Lexy-Puss? 24th day of July. The month is beginning to wane, but still it is summer and holiday! I am pleased to look back at the projects we have done so far. There is something satisfactory in seeing finished result of long time planning. Normally I am very focused on the process of things and hence many plans remain on the planning-stage. But I think that keeping the attention on what I wished for, finally paid off: We have now, particularly thanks to Mum, got ourselves a "New" and very improved livingroom! It is wonderful and almost incredible to wake up every morning now and see that it's still there. Not just a dream but a dream come true! Another project, or rather a mission, was the task of rescuing and looking after 7 tadpoles. Their tiny puddle was going to dry up completely in the warm summerdays, and I decided to try and save as many as I could. I like frogs and toads cause they do a good job catching a variety of insects. Well, after 3 weeks the tadpoles had grown both legs and arms, and were ready to enter dry land and breathe with lungs instead of gills. So yesterday I brought them back to the water and wished them a safe life. We have stayed at home most of this summer, and frankly that's my favourite way of spending the summer. But we have been to see our friends and the dogs at their "summer residence". It is always great to meet them, and we had a lovely day together. I have never been comfortable with painting and redecorating. Many people do this quite frequently and naturally become great at it. Thanks to the experience of transforming our livingroom I decided to use left-over painting to change some furniture also. So that it would match the rest so to speak. This proved to be much easier than I thought, and very rewarding! I am very pleased with overcoming my reluctance for emulsion, and I expect more bits and pieces will be treated to a makeover. "As long as there is paint, there is a possibility!" The secret, I have discovered, is to obtain the best kind of tools. Never too late too learn something new. Funny how much you can do if you really want to, and take the chance of trying! The Dog Days began on 3rd of July, according to old ( ancient?) tradition. At our place it coincides with the dawning of the Cat Days! Friday 25th of June our kittens arrived. Kitty and Katie soon became Mindys playmates. She thinks they might be small dogs, for they are playful and not dignified as 7year-old Lexy-puss... Mindy and Kitty experienced "friendship at first sight". Kitty is an exceptionally soft and openminded kitten. She takes everything in her stride, and did not object to a thorough sniff-down by Mindy. Mindy, on her part, was thrilled to particles by the close encounter of not one but TWO real cats, however small. All babies need to bite and chew with their sharp milk teeth. That's nature! Kittens are very cute, but I'm looking forward to when they get older and less mischievious. But they soon will be, and we will remember their rascal-moments with rose-coloured nostalgia. Such is life at our place during the first Dog Days of 2010! May you have a summer filled with what your heart desires! After a month without batteries for the camera, the replacements finally arrived. Now we're back on track! The garden shows its true summer-colours. Mindy and Lexy-puss develops slowly but surely some kind of "friendship" after Kaisa died. They are getting to know eachother after a long time of reluctance. It is good that Mindy starts understanding that cats can be friendly. In a few days our little family will be joined by Kittie and Catty. The two black and white kittens born upstairs in April. Friday 30th April our dear briard-dog Kaisa passed away. She had then been with me for 15 years. 15 eventful years... It was a hard day for Steve and me and Mindy. We had the vet come and put her to sleep here, at home. It was very sad, but I know she is happy and free now. She went so peacefully. Since that Friday life has been different. Something was missing. Kaisa filled our lives with much fun and care and life. We miss having her around, miss her teasing glances and initiatives to play. She was a lot of fun! The day after Kaisa died, I got the message that my best friend's father had passed away. Yesterday I went to his funeral. A very moving ceremony in the chapel. My friend and her sister spoke with such warmth and care about their father. It hurts so much to lose the ones we love, the ones who have always been there for us. It is hard to accept this part of life. In younger years I used to think there would come a time when life was just perfect and was going to stay that way ever after. Like arriving at a promised destination. But this has never been part of the bargain. We learn about life in many different ways. My comfort is that the pain we feel when we lose someone dear, just mirror how much they really mean to us, how much we loved them. The ones we love never really leave us! I believe we will meet again. This gives me hope that life, just like spring, just like energy, will never perish! It'll only change into a different form. Right now, outside my window, the sun is about to set. Tomorrow is a stranger. A new day full of possibilities and precious moments! Sieze the day, my friend! Time flies! Green blades of grass are now fighting their way through an almost defeated-looking lawn. White anemones have returned too. Amazing how one day they are suddenly there! They always bring me a strong promise of spring! As children we used to pick handfulls of them to bring home. Now are mostly left alone where they grow. More beautiful there. Like a magic carpet they cover the forest floor in white blossom. A living carpet between the naked trees. Truly beautiful! I have just been to see Einar upstairs, and of course I said hello to the cat-family. Our three little ones have really grown a lot in their first week! One of the girls has even started opening her eyes! "Hello Kittie!" All this against a backdrop of volcanic activity on Iceland. It's been a very quiet 4 days in the air since no planes has come or gone since Wednesday. We can choose to let it darken (literarily speaking) the days and our future already, or we can look for positive signs around us. There are plenty to be found of both kinds! I think it's a bit easier to be happy, though: After all, it's SPRING! Hope you can feel it too! Easter is over, and we are well into April. Amazingly enough all the snow has melted, uncovering things lost since last December... Like a snowed-down glass-lantern. It had a short but devestating encounter with our snow-blower just before Christmas. It had completely vanished without a trace under the eagerly falling snow. But not anymore! I understood how it must have happened as I started to come accross the first twisted scraps left of the metal-frame. Also little glittering very sharp bits of glass were scattered around. A lesson learned: I'll never forget to remove anything breakable in winter. In fact, nothing will ever again be placed anywhere where a snow-blower can reach! I have found little bits all over the lawn. Amazing how far that machine throws the snow. Fortunately the grass is still has an "ironed down" flat look after its longlasting snowcover . The bigger glassplinters aren't too hard to spot. It helps, as I say, that they glitter in the sunshine! Still there are more left., so I will look until there's no more glittering in the grass. I'd like to walk barefoot in the summer- morningdew... And there are of course plenty of paws to consider! Springflowers are starting to come up. And so are different sorts of weed. Life returns! The wagtail arrived with promises of warmer times. Birds fill our world with eager singing. Song-thrush, blackbirds, robins and different finches. This makes me happy after a long and silent winter. Our neighbour-cat Mona gave birth to 3 kittens on 9th of April. We have decided to have two of them, and the third is going to stay with its mum and big sister. The mice-population have reasons to tremble. There are a lot of them around. 52 mice have had a short visit in our part of the house. We used both humane traps ( where Steve released the mice out "far away" ) and that other type. Now there'll be more of the the natural kind; the reuseable feline-trap with 5 sharp corners (each!)! I have just counted on the calendar: today is day no. 80 of snowy winter. (I.e we have had snow on the ground for 80 days in a row!) Some people might think this is nothing special for Norway. But I can't remember any winter in the past where snow has lingered so long- without any spells of "complete melt-down" in between. In the southern parts of the country we have become accustomed to so few days of "real winter" with snow that some of us haven't been skiing since we were very young indeed( a very very long time ago, in other words... ) The global warming and other natural cycles have seen to this. If snow and cold weather stayed for more than two weeks it was incredible in the past 20 years. We were told by a variety of experts that this is what we must expect from now on. Yes, we have had cold weather and snow in winter. But quite often it came after Christmas ( which is in any case too late, if you ask me... ) and all for a short while. Nothing worth bringing out skis etc. for. But this winter has been different. 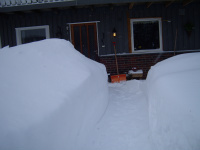 It has all the ingredients of oldfashioned winter as it used to be in different parts of Norway - not in coastal areas. I like snow and want there to be snow and low temperatures in winter. ( to erradicate plenty of tics and other bugs that tend to survive mild winters, and of course to prevent an invation of scorpions, snakes and other dangerous creatures normally associated with warmer climates... ) This winter started approx 16th December 2009, a relatively frosty day. We have seen temperatures down to minus 24 degrees celcius, which is quite cold. Today is 7th March. Day no 80 of WINTER. I must confess that I no longer cheer when weather-forecast says to expect "snow". March, after all, is known as the first month of spring, traditionally. And after any winter most people desperately need to see snowdrops, crocuses and daffodils, and hear twittering birds at this point. A couple of days ago we saw 20 cm of freshly fallen snow on top og the 100 cm or so we've already got... But we all tell ourself ( more and more desperately ) that spring is expected any moment now! A little bird told us so! In less than an hour we leave 2009 for ever. Another year has arrived and we know nothing about what it'll bring. Wishes, dreams, plans, hopes and New-Year resolutions are guidelines which we decide. They show us possible directions. Exciting, isn't it? Standing in front of a brand new unused year! We celebrate the coming of a new year in our quiet neighbourhood. No noise and just a few fireworks at the right time. No gathering in the street or exited crowds counting down. The way we and the dogs like it! Time flies! And before the radio has ABBA singing "Happy New Year" once again, we wish you and your loved ones a special year full of great possibilities! 23rd of December came with a lot of snow! It got dangerously slippery on the roads, but this didn't prevent last-minute-shoppers (including yours truly) from spending money and joining in the traditional pre-christmas-traffic-jams around shopping-centres... Traditions must be kept! In spite of the crowds and the chaos I enjoyed the snow coming down in abundance! Everywhere looked the part. Oh, I do like the prospect of WHITE Christmas! Last time we saw snow on 24th December was in 2004. Everything seemed to promise a dream coming true this year. But then, for reasons we shall never know, weather changed from frosty to mild temperatures just on our special day. We got rain... However, there was already deep snow everywhere so this didn't make much difference. And today on Christmas Day snow started to fall once more. Plenty of it to cover up the mistake with the rain. We hope anyway that you enjoy your Christmas celebrations, and wish you all a peaceful and good new Year by the number of 2010! Thursday morning we woke up to snow! An incredible amount of snow had fallen during the fullmoon-night. The trees were heavy with soft thick snowcaps. Like entering a scene from a christmas-card. Both Steve and I enjoy the prospect of living in a Winterwonderland. But this particular morning we had a very busy program. The snow plough had forgotten us in our remote countryside-road, so we and Lilly ( our quite small and lilac car ) had to manage on her own. As we went by winterscene after winterscene on the slippery road, we realised that winter had been particularly generous at our place. In town there were less snow, and where I work the layer of snow was very thin indeed. And it was quickly melting into the usual slushy stuff so often associated with winter these days... After a lovely visit to Mommose that evening, we came home to our still intact winterwonderland! Sure, snow causes problems but it certainly brightens up the dark season too! We had a very nice surprise on our way back from our Saturday-walk last week: Marit and "the pack" was waiting for Mindy an me in the field by our house. We all had a walk together, "Majabissene" wanted so badly to dig up a mouse or ten! It must be mouse-year this autumn. We have caught quite a few in the house so far. But the dogs did not find any thias time. In the end however, they got the scent of a rodent, by the water, under a big heap of sticks... The beaver, known by Mindy as The Stick-Monster, kept away. But we knew it must be around. It had collected winter-feed by its lodge. Lots of trees have been felled recently in the neighbourhood. The beaver has been gnawing down trees just outside our garden too. I was worried it would fancy the plum-trees next... But it rather seems to have a taste for other types. Fortunately! Soon the beaver will go to sleep anyway. It usually spend the coldest of winter in its snug home with the family. Perhaps it has even got a chrismas-tree in there? Who can tell? But winter, as we think we know it, seems to be far away. Rain, flooding and high temperatures are the weather-ingredients at the moment. I have ordered a white Christmas this year. One can always hope. , and Anita has her Australian sheperd named Troja. Kaisa, being very old and a bit frail, stayed home with Steve ( who also felt a bit frail today). She had already been for a walk this morning. But Mindy needs a lot more. She is not 1 year old untill the 15th of this month, and is naturally full of beans. Another long walk did us ever so good! She tends to try bossing a bit with other dogs, in spite of her size. So she also learned some better canine-manners. Indeed, she was properly tired when we got back, and is now fast asleep. The 30th September we woke up to a frosted lawn. Everything was taken by surprise! Like this crystalised dandylion. The pumpkins only sustained some darker spots, but their leaves were all blackened and dead with frost. Emergency-harvesting therefore took place the same day! This crisp and clear morning reminded us that winter is just a few weeks away... And so the season of Christmas draws near! A wet September so far. Mushrooms are popping up everywhere! We have gone "hunting" as often as we can, Mindy and I, and sometimes Steve. Summerholidays are now behind us. But if you're a keen "mushroom-hunter" there's no need to despair! Already we have seen lots of different fungi in the forest. I have always dreamed of having our very own chanterelle-place in the garden. And as it turns out autumn-chanterelles grow just outside the lawn! This is the season for fruits and berries too! We have made our own jam and juice from blueberries, black currants and red currants. And now the plums are ready for tasting and picking! I believe we can fill the pantry with sweet memories from this summer. Something to enjoy and cherish when the days grow shorter. WISHING YOU A SUPER AUTUMN! It's true that living in the countryside has a lot of blessings. Particularly for stressed-out citypeople. Now that spring has given way for summer, however, trouble is on its way...or rather: on its wings! You don't see them at once. But if you venture outdoors after sunset, you instantly feel their precence: MIDGES! Size doesn't matter: the tinyest of insects can turn a lovely, quiet summer's evening into a miserable affair. You go out with the dogs to enjoy the view. You take a deep breath. Sigh with delight over the perfect vista in front of you: a still lake at the end of the garden. No breeze to create ripples on its surface and thus disturb a perfectly mirrored forest. Fish are jumping and the rushes are high (there's a song here somewhere...) Then suddenly it happens! You fall brutally out of your revelries as you find yourself ( -and the dogs) surrounded by hundreds and hundreds of tiny swarming MIDGES! An army of ravenously hungry insects. They smell blood... And when they attack, it stings! You suddenly don't care all that much for closeness with nature. Caught off your guard as you are: no insect repellent at hand. All you can think of is gettng inside before you and the dogs are covered! These villains are not fussy: they don't bother if you wear clothes or fur: Nothing seems to keep them from getting the bits they want! Meals on foot, yeah! At last inside again. You rub your itchy, bitten skin thinking what's wrong with the view from the window anyway? The dogs couldn't agree more! I used to think that living close to water and forest meant a lot of mosquitos. Now I feel that they are gentle amateurs compared to midges. Annoying little pests! But on hot and sunny days they don't come near us. Their tiny bodies will quickly dry out in the heat. Therefore I wish for warm and sunny summerdays! Some wind wouldn't be amiss. We have learned our lessons quickly: quiet evenining weather means you're best staying indoors - or take a trip to the sea! We are a little family, counting 2 dogs, 1 cat and us: Steve and me, Jorunn ( Jo ). We live on the south coast of Norway, 20 minutes' drive from Kristiansand. Out here it is countryside, with forests, rivers, waterfalls, birds, elks, beavers, deer and elks, and even lynx they say! Wolves have been seen not too far from here also, a couple of years ago. In fact, the term "wilderness" might spring to mind about our whereabouts! Every morning feels like a Sunday; all peaceful and in tune with nature. Wildlife, trees, a lake at the bottom of our garden... To me the view from our kitchenwindow is nothing less than a dream come true! relaxation after a busy day at work. To some it might be a bit too quiet. But when you work in a Kindergarten it is simply Heaven! Besides, we lived in the middle of noisy, busy, crowded Kristiansand several years previous to coming here. ( Kristiansand is ranking as the 5th largest town in Norway, but of course only as a large village in e.g Britain... ) Anyway, I prefer country-life here! Our 2 dogs are called Kaisa ( Note: not like the German "Kaiser" or "Caiser", Kaisa is a Swedish girl's name ) and Mindy. Mindy (kromfohrlânder) is 6 months now, and Kaisa (briard) is a senior at 14! ( -years..) We have a cat named Lexy, and she is 6 years, we think. She deals with the dogs very well. Lots of flowers, herbs, rhododendron-bushes and other flowering shrubs. It's full of possibilities! A great place to be.